Natural Bridges National Monument features three large natural bridges, Kachina, Owachomo, and Sipapu, set at the bottom of two adjacent canyons. 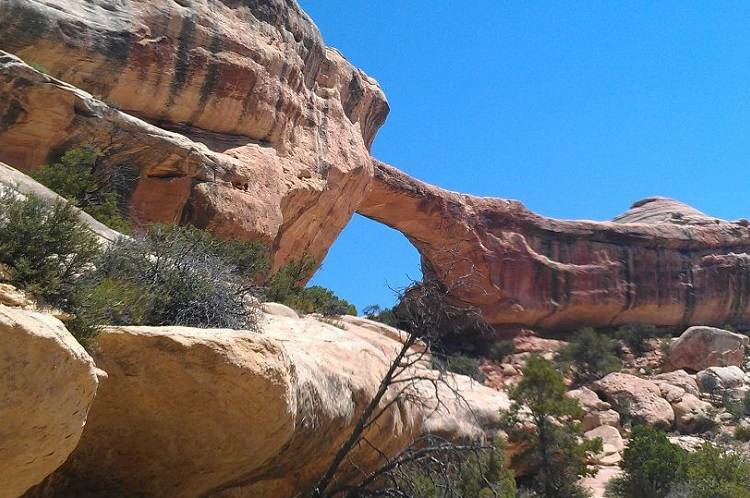 Visitors can view the arches from an overlook or hike trails to experience them up close and personal. Natural Bridges National Monument was declared a National Monument in 1908. This park is also the world's first International Dark Sky Park. The three bridges are named "Kachina," "Owachomo" and "Sipapu" in honor of the Native Americans that once made this area their home. The entrance to Natural Bridges is at the end of UT-275, 35 miles west of Blanding, Utah, on UT-95. The visitor center is open daily from 8:00 a.m. to 5:00 p.m. (October and April) 9:00 a.m. to 5:00 p.m. (November through March) and 8:00 a.m. to 6:00 p.m. (May-September). The park is closed Thanksgiving, Christmas and New Year’s Day. Admission is $10 per vehicle, $5 per motorcycle or individual. Campgrounds onsite consist of 13 sites and are available first come, first served at $10 per night.